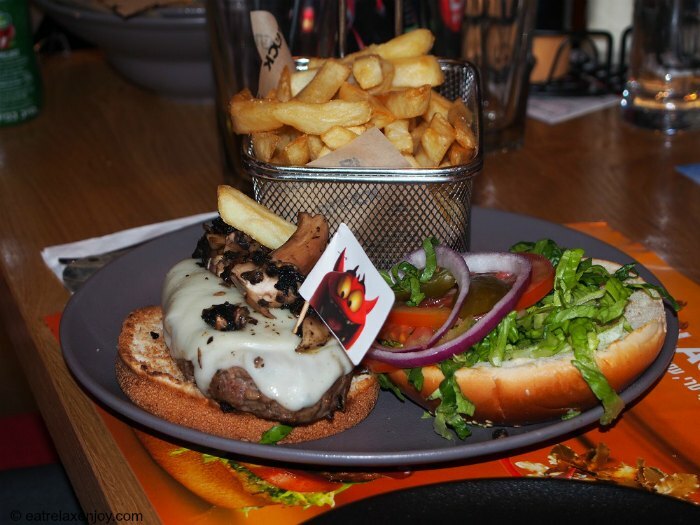 Black is one of the leading Burger bars in Israel that features meat and alcohol experience of the well-known Israeli chef Tzahi Buksheshter. 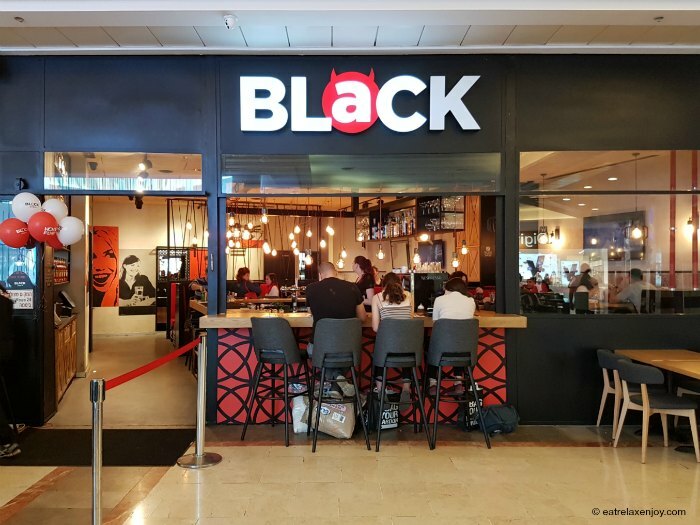 Black restaurant at the Grand Mall in Haifa is considered the best restaurant in the chain. 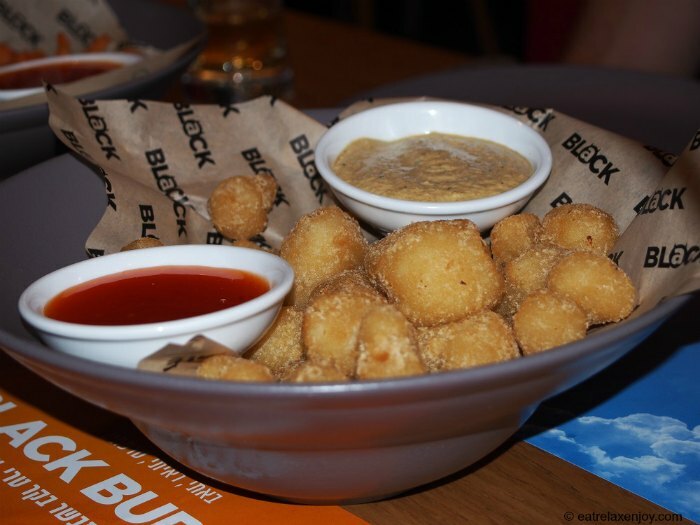 We visited Black Grand Mall Haifa and highly recommend their food and service – with great hamburgers, starters, and wonderful desserts. 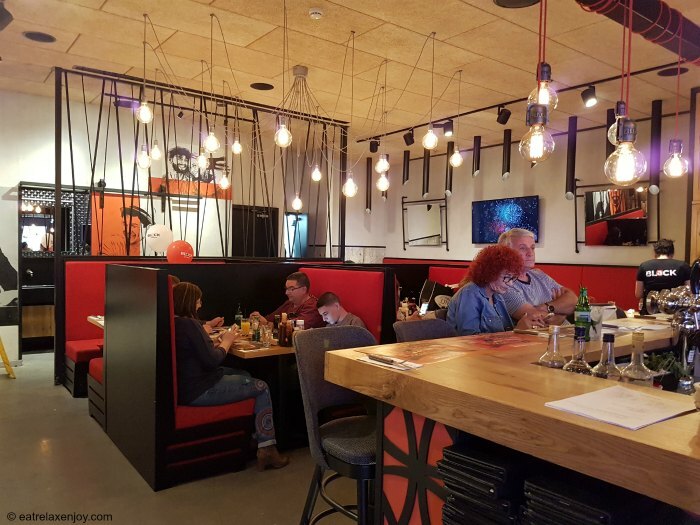 Black’s décor is like an American diner with booths, bar seating, and a private room for events. This is a restaurant for all the family. The food here is American; the restaurant became famous of its fine hamburgers, but offers beef, poultry, and healthy dishes. Some of desserts here are extravagant, which the youth will fancy. We ordered a number of starters – crunchy cauliflower, onion rings, and sweet potato fries. Crunchy Cauliflower with two dips. They were soft and tasty. 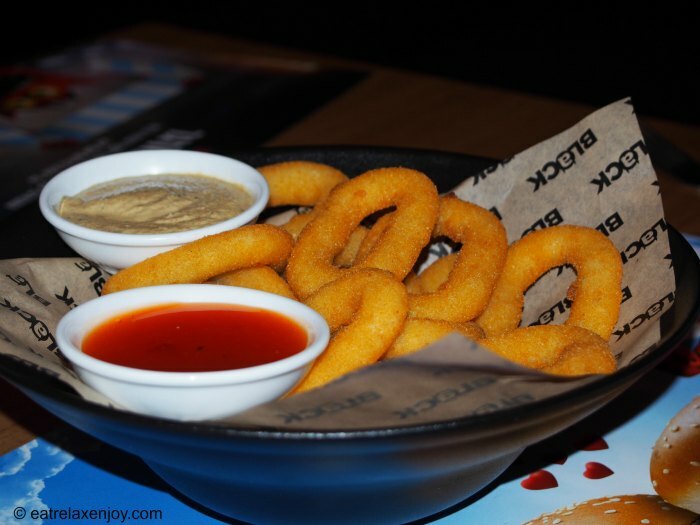 Onion Rings with red chilly dip. Yummy! 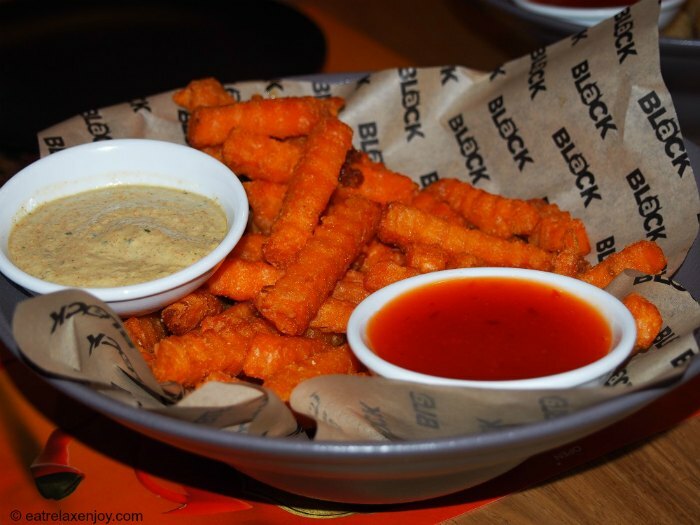 Sweet Potato Fries served with Chili and Tartar Dips – excellent! I loved every bite! All the starters were served with the same dips – Sweet Chili and Tartar sauce, the latter is made according to Tzahi’s recipe and is wonderful! Fits well with all the starters. For main courses, the youth had Fried Chicken (Schnitzel) and we had a hamburger and a steak. 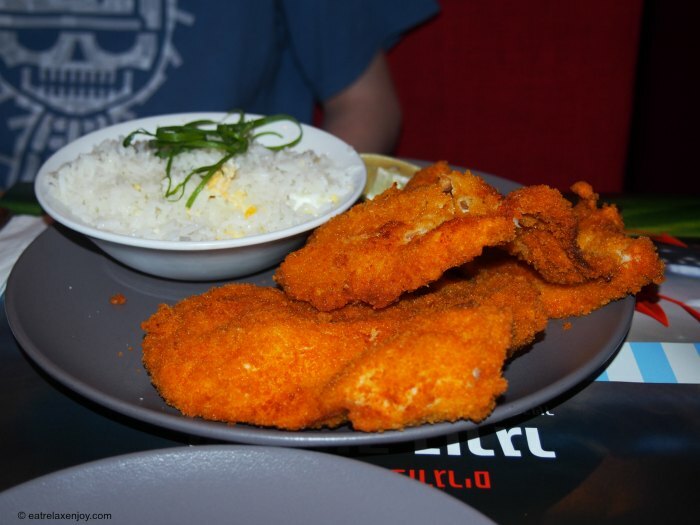 The fried chicken Schnitzel is huge, crunchy, and is served with a choice of rice, mashed potatoes or fries. 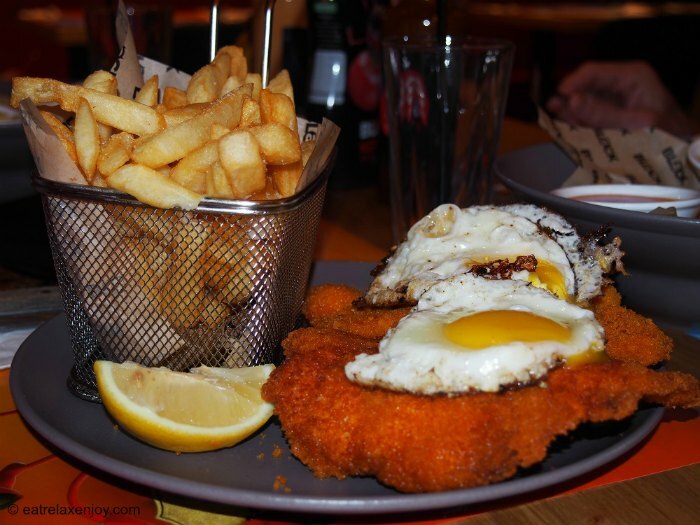 This is a little twist – the eggs fit really nicely with the Schnitzel. Entrecote Burger - A gourmet burger, which I had with mushrooms and mozzarella cheese. I loved every bite! Although it did not look as pink as I usually have it, it was soft and melted in my mouth! 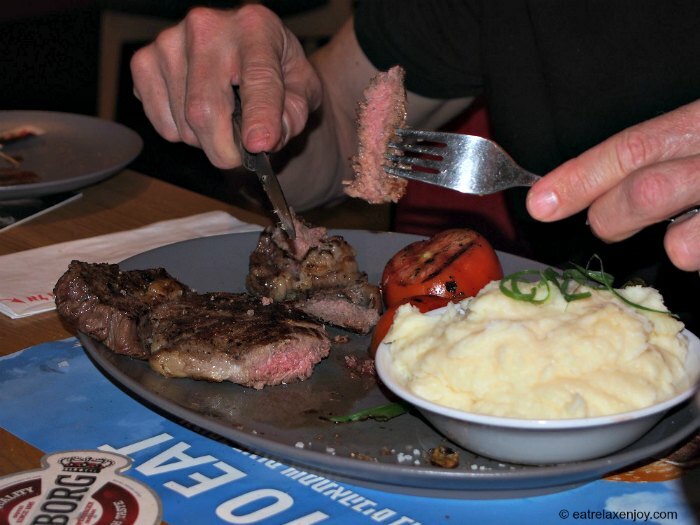 Entrecote Steak – 300 grams of aged meat with dairy mashed potatoes. Made to order and very juicy. For dessert we ordered a Chocolate Soufflé, Ice-cream Sandwich, and Crème Brule. The youth ordered a fancy milkshake. 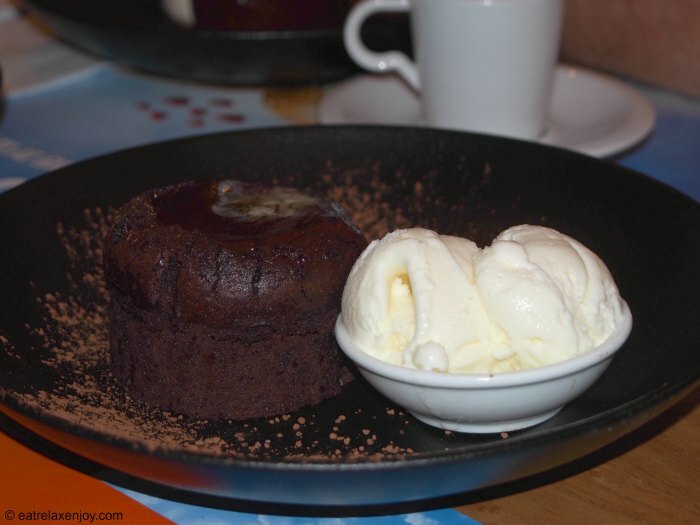 Chocolate Soufflé – “An experience of rich chocolate soufflé with vanilla ice cream” it was written in the menu, and this is a very accurate description. This dessert is very rich and was gone within seconds! The youth loved it. 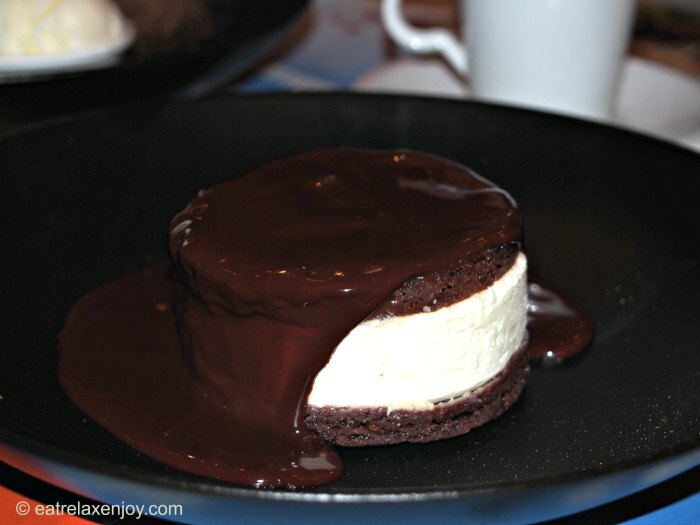 Ice Cream Sandwich in a Bath of Chocolate – a cold ice-cream sandwich swimming in warm chocolate sauce, wonderful! Crème Brule – This is a variation including layers of thin Tuiles and frozen Crème Brule, with sweet Rum sauce and caramelized bananas. This was the dessert for us and it was excellent! Very sweet but pleasure in every bite! To understand the extent of this dessert, you must look at the picture. 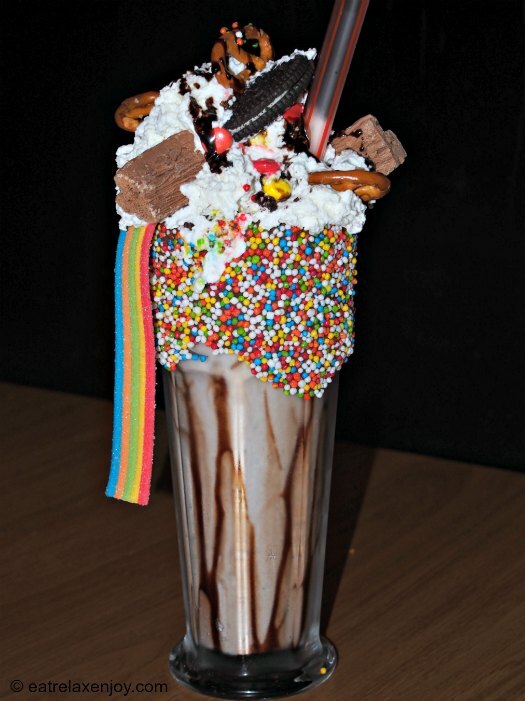 This is a milkshake loaded with candies, one that the children would die for! Although we saw it in the menu, nothing is like the real thing! The youth became alive in a second, left the Smartphones immediately (which is unusual!) and explored it. A pile of whipped cream with everything they can imagine – Oreo, candies, chocolate, little pretzel, M&M, etc. If you plan a party, order this for the children but don’t tell them it is coming, they won’t forget it for a while! 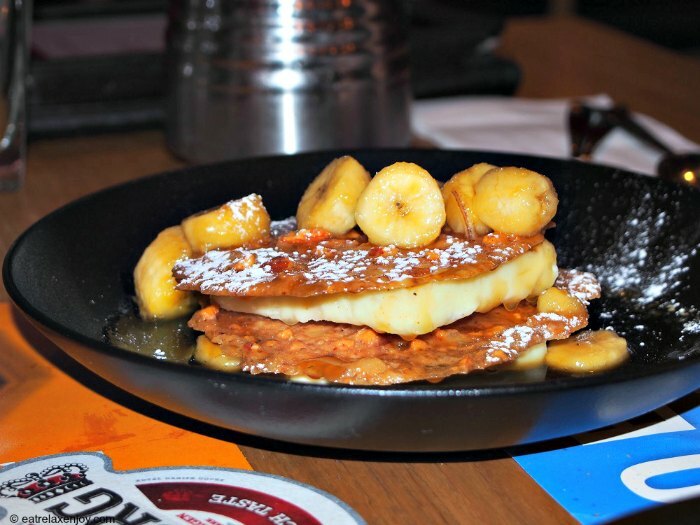 In summary, Black Grand Mall Haifa is recommended for a good meal for the whole family and for parties as well. 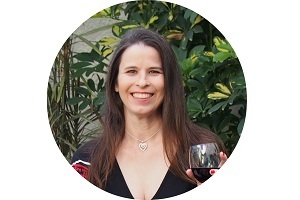 The restaurant is pleasant, food is good and service is excellent!